Rotator Cuff Surgery is generally not the best idea for shoulder tendonitis, but if one of the tendon of the rotator is partially or completely torn, surgery is the go to tool to repair the damage. The 'Cuff' is a group of four muscles and their tendons that wrap the shoulder joint. They're not the only ones that do that, but those four got the name. 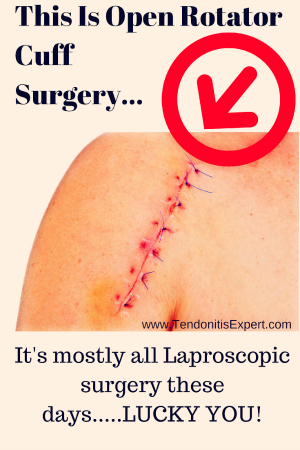 Any of those tendons can rip/tear, and when that happens, repair surgery may be necessary. Four muscles/tendons are involved; the Infra- and Surpraspinatus, and the Teres minor and major. There are basically two different types of Rotator Cuff Surgery. Open surgery is like the picture below. A large incision is made so the surgeon can visualize the tendon and surrounding area. Laproscopic surgery just makes two small punctures and then tools are inserted. A camera so the surgeon can see, and a cutting tool grabbing tool to clean up and remove tissue, and a suturing tool to (re)connect tendon. Less damage from surgery provides less downsides. That makes sense. It is important to understand that surgery isn't a magical cure-all. It may be necessary to reconnect torn tendon tissue, but be aware that surgery itself causes damage to the body and that the body has to recover from that as well. They can also do procedures that include lasers and such nowadays, but for the most part, you'll be looking at either open or keyhold (laproscopic/arthroscopic) type procedures. Rotator cuff surgery is generally effective at REATTACHING completely ruptured tendon, and repairing partially torn tendon. Most rotator cuff damage is the outcome of years of degenerative process weakening tendon. Surgery can reattach tendon, but it entirely ignores the elements that caused the degeneration and loss of structural process in the first place. the surgery might 'fail' because those factors continue to cause problem at the repaired tear site. But overall, yes, surgery does effectively reattach/repair torn tendons. Do you actually need Rotator Cuff Surgery? 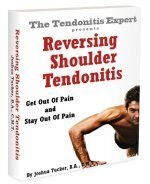 If you have Rotator Cuff Tendonitis and no rip/tear injury then no you don't. If you just have the tiny wear and tear damage from 'degenerative' processes (which is really a symptom of something and not a cause), then you pretty much don't need surgery. Surgery can 'clean up' the wear and tear damage....but it creates more wound and damage and ignores the causes of it in the first place. What is the cause of my shoulder pain? Do I have an actual tear in a rotator cuff tendon? Do the possible benefits outweigh the risks? What can I realistically expect from surgery, meaning, how much better will I get? What exact self care regimen will you prescribe? how much do I use my arm/shoulder? Does this injury limit the use of my arm? If so, does it really affect my life all that much? Can I live with this if I need to? Is fixing it worth the expense and risk of surgery? Utimately, these questions should be answered. If you don't use your arm much and can live with a torn or completey ruptured shoulder cuff tendon, then surgery just may not be worth it. If you definitely do need full use of your arm (seriously, some people don't), then surgery is worth looking into. There is a different conversation in the elderly population with shoulder injury than in the younger generations. 'Old people' heal slower, are at more risk from the insult of surgery, and comparatively, just don't move around or do as much as younger people. Obviously that is more true as the age of an individual increases. For surgeons, age is an important factor when recommending surgery, or as the case may be, not recommending surgery. 'You are not very healthy, and surgery can be traumatic and might cause you other problems, so I advise that we forego surgery...it's just not worth the risk (the risk being infection, general trauma to a body not able to handle much trauma, etc). I hate to say it, but these are actually viable reasons to leave a torn tendon torn. Aside from the expense of surgery, it comes with certain risks that are/can be real dangers to those in the elderly population. Ultimately the thing to understand is that completely ruptured tendons don't heal themselves back together. And big tears aren't going to either (ongoing pain and tearing until complete rupture). Little tears, depending on how little, will continue to tear (sooner or later) unless you EFFECTIVELY treat the factors that cause the dysfunction and then the tearing. Even if it's a major tear but has little impact on your life, then surgery on the rotator cuff tendon may, or may not, be worth it to you. Return to the top of this Rotator Cuff Surgery page.